← Too Smart for a Target Date Fund? One of my favorite things about credit cards is that I get 30 days to make a payment after my statement becomes available. I love waiting 25 days to pay – not because I don’t have the money, but because I consider it a 25 day interest free loan. Instead of paying immediately, the money sits in my savings account and earns interest. I am fully aware that the interest I am earning is pretty insignificant (we are talking a few dollars over the course of a year), but its free money and it makes me happy. The only drawback to doing this is that my credit utilization rate will be higher, and if that rate is too high it can affect my credit score. A credit utilization rate is simply the ratio of money owed vs. available credit. Here’s an example: Lets say I spend about $1,000 a month on my credit card which has a credit limit of $8,000. At the end of May I will have a balance of $1,000. If I pay my statement immediately, I will start June with a $0 balance. The largest balance I will ever have on my card is $1,000, meaning at most I will be using 12.5% (1,000/8,000) of my credit limit. (Credit utilization rate is 12.5%) If, however, I wait 30 days to pay off my statement, I will start June with a $1,000 balance and by the end of June my balance will be close to $2,000. My payment of $1,000 for May’s statement at the end of June will be on time, but at the end of every month I will be using 25% (2,000/8,000) of my credit limit. (Credit utilization rate is 25%) I wasn’t sure how much was too much in terms of credit utilization so I did a little research. The second most important category is money owed vs. available credit, or credit utilization. According to most financial experts, the lower your credit utilization the better. 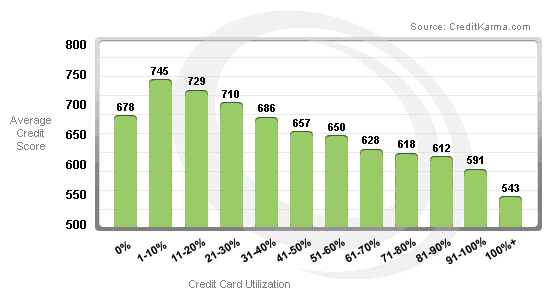 The following chart from Credit Karma is an excellent depiction of this trend and is the best explanation I could find on what is the most advantageous credit utilization percent. As you can see from the graphic, your best bet is to use less than 10% of your credit limit. It is important not to infer that credit utilization is the only driver for credit scores. Check out the original article for more details. Should I be measuring credit utilization for each card or for total available credit? I have one other card with a $4,000 credit limit that I rarely ever use (because I don’t get cash back). If I use that card in my calculations, my total credit limit is $12,000. At most I will have a 16.6% (2,000/12,000) credit utilization rate, which sounds much better than a 25% utilization rate. So which is it?